The evidence of an association between women with big waists and the onset of diabetes got a little bit more solid, thanks to a study of more than a third of a million Europeans comprising 4 million person-years of follow-up. The effect is seen regardless of overall body-mass index, researchers reported June 5 at PLoS Medicine. The prospective InterAct case-cohort study conducted in 26 centers in eight European countries, is investigating how genetics and lifestyle interact to affect diabetes risk. This cohort follows 12,403 diabetics. Body-mass index and waist circumference were each independently associated with diabetes, with waist circumference being a stronger risk factor in women than in men. Risk increased across groups defined by body-mass index and waist circumference. Compared to low normal weight individuals (body-mass index 18.5 to 22.4 kg/m2) with a low waist circumference (less than 94/80 cm in men/women), diabetes occurred more frequently in men (hazard ratio [HR] ,22; 95% confidence interval [CI] 14.3 to 33.8) and in women with grade 2 obesity (body-mass index greater than 35 kg/m2) and a high waist circumference (greater than 102/88 cm in men/women) (HR, 31.8; 95% CI, 25.2 to 40.2). Overweight people with high waist circumference had a 10-year cumulative incidence rate of 70 per 1,000 person-years for men and 44 per 1,000 person-years among women. This was comparable to the rate seen among obese people of 50 to 103 per 1,000 person-years in men and 28 to 74 per 1,000 person-years in women. In short, a waist measurement is a quick and effective way of identifying people for further interventions, the authors noted. PLoS editors pointed out this extends screening to people who are overweight (body-mass index of 25–30 kg/m2) as well as obese (body-mass index of greater than 30 kg/m2. Waist circumference and waist-to-hip ratios are already associated with mortality, a separate study found. Waist circumference is just as important as other risk factors for diabetes and prediabetes, say internists in this March 2011 article at ACP Internist. Clinical instructions to measure Body-mass index and waist circumference published at ACP Internist. 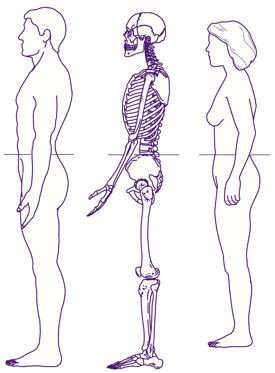 To define the level at which to measure waist circumference, first locate and mark a bony landmark. The subject stands and the examiner, positioned to the subject's right, palpates the upper hip bone to locate the right iliac crest. Just above the uppermost lateral border of the right iliac crest, draw a horizontal mark, then cross it with a vertical mark on the midaxillary line. Place the measuring tape in a horizontal plane around the abdomen at the level of this marked point on the right side of the trunk. The plane of the tape is parallel to the floor and the tape is snug, but does not compress the skin. Make the measurement at a normal minimal respiration.